Osteosarcoma, a class of cancer originating from bone, is the most common malignant bone tumor in children and young adults [1-3]. Despite current therapeutic strategies combining adjuvant chemotherapy, surgery and sometimes radiotherapy, the prognosis of osteosarcoma patients remains poor, since about 80% of patients eventually develop recurrent metastatic osteosarcoma following surgical treatment, and the 5-year survival rate of these patients is only 50-60% [4,5]. Thus, new effective drugs and biomarkers to predict its prognosis are needed [6-8]. MicroRNAs (miRNAs) are small RNAs that can regulate gene expression via complementary base pairing with the 3’ UTR of target mRNAs, resulting in translational repression or mRNA degradation. It has been proposed that miRNAs can play an oncogenic or tumor-suppressive role, depending on the target genes or the cellular context [9,10]. Furthermore, miRNA-expression profiling of human tumours has identified signatures associated with diagnosis, staging, progression, prognosis and response to treatment . MicroRNA-205 (miR-205), located in 1q32.2, acts as an oncogene or tumor suppressor by modulating the expression of multiple cancer-related target genes. Previous studies found that the expression of miR-205 was significantly lower in osteosarcoma tissues than in normal bone tissues, and the abnormal expression of miR-205 might be a key factor in osteosarcoma progression [12-14]. In the present study, we aimed to investigate the clinical significance and prognostic value of miR-205 in osteosarcoma patients. A total of 103 pairs of osteosarcoma tissues and their matched adjacent normal bone tissues were obtained from patients who underwent surgery at the Qilu Hospital of Shandong University between 2010 and 2016. All patients enrolled in this study offered written informed consent. This study was approved by the Ethical and Scientific Committees of the Qilu Hospital of Shandong University, and it was performed in compliance with the Declaration of Helsinki Principles. All tissue specimens obtained from patients with osteosarcomas were handled and made anonymous according to the ethical and legal standards. All the patients recruited into the present study did not receive radiotherapy or chemotherapy or any other treatment before and after operation. At the time of surgery, all tissue samples were immediately flash frozen in liquid nitrogen and stored at -80°C until use. The diagnosis of osteosarcoma was confirmed pathologically. The clinicopathological characteristics of osteosarcoma patients are summarized in Table 1. Table 1. miR-205 expression level with clinicopathological features of osteosarcoma. Total RNAs were extracted from the tissues using Trizol reagent (Invitrogen, Carlsbad, CA, USA) according to the manufacturer’s instructions. cDNA was reverse transcribed from total RNA samples using specific miR-205 primers from the TaqMan MicroRNA Assays and reagents from the TaqMan MicroRNA Reverse Transcription kit (Applied Biosystems, Foster City, CA, USA). Quantitative reverse-transcription polymerase chain reaction (RT-qPCR) assays were performed to evaluate miR-205 expression in clinical osteosarcoma tissues and non-neoplastic bone tissues. The concentration and purity of all RNA samples were detected by NanoDrop ND-2000 spectrophotometer (NanoDrop Technologies, Houston, TX, USA). NCodeTM SYBR® Green miRNA qRT-PCR Kit (Invitrogen, Carlsbad, CA, USA) was used to synthesize specific cDNA of miR-205 and U6 (as an internal control), and perform qRT-PCR, which was analysed with the DNA Engine Opticon 2 Real-Time Cycler (MJ Research Inc., Waltham, MA, USA) according to the manufacturer’s instructions. Each sample was examined in triplicate and the 2-ΔΔCt method was used to quantify the relative amount of miR-205. The t-test was used to compare differences in miRNA expression between osteosarcoma tissues and noncancerous bone tissues. The relationship between the clinicopathological characteristics and miR-205 was estimated by chi-square test. Associations between overall survival and miR-205 expression were evaluated using Kaplan-Meier analysis according to log rank test. Cox regression was carried out to determine the prognostic effects of clinicopathological characteristics. A value of P<0.05 was considered to indicate a statistically significant result. All analyses were performed using SPSS version 18.0 (Statistical Package for the Social Sciences, Chicago, IL, USA). miR-205 expression levels in osteosarcoma tissues and adjacent normal bone tissues were detected by qRT-PCR. We found that the expression levels of miR-205 in osteosarcoma tissues were significantly lower than those in noncancerous bone tissues (P<0.001, Figure 1). To investigate the associations of miR-205 expression with the clinicopathological features of osteosarcoma patients, we divided the 103 patients into two groups using the median value of miR-205 expression levels in osteosarcoma patients as a cut-off point. Of 103 osteosarcoma specimens, 51 highly expressed miR-205, and 52 lowly expressed miR-205. 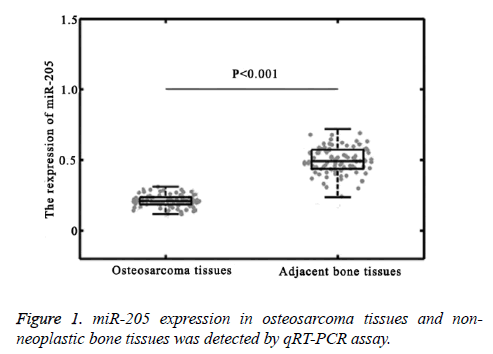 Figure 1: miR-205 expression in osteosarcoma tissues and nonneoplastic bone tissues was detected by qRT-PCR assay. We compared the clinicopathological factors of the high and low miR-205 expression group and found that low miR-205 expression was significantly associated with patients with advanced clinical stage (P=0.001) and presence of distant metastasis (P<0.001). However, none associations between miR-205 expression and other clinical characteristics were observed, including age, gender, tumor size, and anatomic location (all P>0.05, Table 1). To further evaluate whether miR-205 expression levels were associated with prognosis of patients with osteosarcoma, we performed survival analysis. As showed in Figure 2, the survival time of patients with low miR-205 expression was shorter than those with high miR-205 expression (P=0.046). Log-rank test found that high miR-205 expression (both P<0.001), large tumor size (both P=0.03), advanced clinical stage (P=0.006 and 0.01, respectively), presence of distant metastasis (P=0.003 and 0.008, respectively), and poor response to chemotherapy (both P=0.02) were significantly associated with overall and disease-free survivals of osteosarcoma patients (Table 2). Furthermore, the multivariate analysis with Cox’s proportional hazards model confirmed that low miR-205 expression level was an independent predictor of poor prognosis for the osteosarcoma patients (Hazard ration=2.885; 95% CI: 1.479-8.492, P=0.037, Table 3). 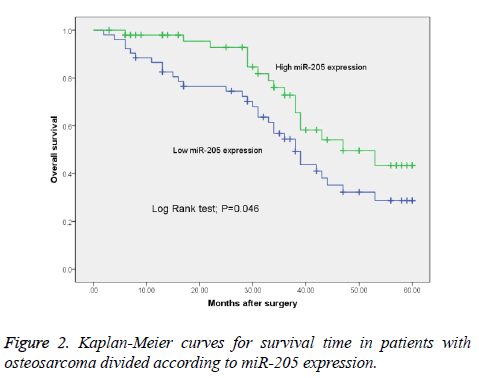 Figure 2: Kaplan-Meier curves for survival time in patients with osteosarcoma divided according to miR-205 expression. NS: refers to differences without statistical significance. Table 3. Multivariate analyses of prognostic parameters in patients with osteosarcoma by Cox regression analysis. Osteosarcoma is the most common malignant bone tumor in children and adolescents . Twenty percent of patients present with clinically detectable metastases, with micrometastases presumed to be present in many of the remaining patients. Despite the aggressive use of surgery, chemotherapy, and/or radiotherapy, the survival for osteosarcoma patients remains poor. Thus, studies to address genes involved in osteosarcoma carcinogenesis may help understand the complex molecular mechanisms underlying osteosarcoma progression and providing potential therapeutic targets and prognostic biomarkers for the clinical treatment . In recent years, microRNA expression profiling has indeed provided evidence of the association of these tiny molecules with tumor development and progression. An increasing number of studies have then demonstrated that microRNAs can function as potential oncogenes or oncosuppressor genes, depending on the cellular context and on the target genes they regulate [15,16]. Therefore, miRNAs play an important role in tumorigenesis and metastasis. miR-205 conducts conflicting functions in human cancers, where it may function either as a tumor suppressor or an oncogene in a single tumor type. For example, miR-205 was found to be significantly overexpressed in human cervical cancer tissues and promotes proliferation and migration of cervical cancer cells by targeting CYR61 and CTGF . Furthermore, serum miR-205 expression level was significantly upregulated in cervical cancer patients compared with healthy donors, and Kaplan-Meier survival analysis showed that cervical cancer patients with high miR-205 expression tended to have shorter overall survival, indicating that miR-205 might be a predictive biomarker for the prognosis of cervical cancer patients . Hou et al. found that miR-205 expression was significantly lower in glioma tissues than in non-neoplastic brain tissues. Survival analysis demonstrated that the cumulative 5 y overall survival rate of patients with glioma in the high miR-205 expression group was significantly higher than that in the low miR-205 expression group, and multivariate Cox regression analysis further indicated that miR-205 expression was an independent prognostic indicator of the overall survival of patients with glioma, suggesting that miR-205 holds potential as a prognostic factor for glioma . Furthermore, serum miR-205 expression was found to be a novel and valuable biomarker for the diagnosis of glioma and a prognostic factor for those with a tumor at an advanced pathological grade . In the study by Orang et al. their data suggested that miR-205 could be reduced in the majority of metastatic Colorectal Cancer (CRC) and the risk of CRC metastasis may be predicted by monitoring miR-205 in CRC samples collected at the time of the initial diagnosis. In addition, miR-205 is capable of distinguishing lymph node metastatic CRC from nonmetastatic CRC . In previous studies, miR-205 was found to be acted as a tumor suppressor by modulating the expression of multiple cancerrelated target genes. Yang et al. found that the expression of miR-205 was significantly lower in osteosarcoma tissues than in normal bone tissues, and miR-205 inhibited cell proliferation, invasion, and migration via targeting TGF-α. Therefore, miR-205 may function as a tumor suppressor via targeting TGF-α in osteosarcoma, and the abnormal expression of miR-205 might be a key factor in osteosarcoma progression . Furthermore, Wang et al. found that miR-205 suppressed the proliferative and migratory capacity of human osteosarcoma Mg-63 cells by targeting VEGFA . Zhang et al. found that miR-205 acted as a tumor suppressor in osteosarcoma via directly targeting RUNX2 . However, the clinical significance and prognostic value of miR-205 in osteosarcoma have not been investigated. Therefore, we aimed to investigate the clinical significance and prognostic value of miR-205 in osteosarcoma patients. In the present study, we found that the expression levels of miR-205 in osteosarcoma tissues were significantly lower than those in noncancerous bone tissues. We then compared the clinicopathological factors of the high and low miR-205 expression group and found that low miR-205 expression was significantly associated with patients with advanced clinical stage and presence of distant metastasis. To further evaluate whether miR-205 expression levels were associated with prognosis of patients with osteosarcoma, we performed survival analysis. We found that the survival time of patients with low miR-205 expression was shorter than those with high miR-205 expression. Furthermore, the multivariate analysis with Cox’s proportional hazards model confirmed that low miR-205 expression level was an independent predictor of poor prognosis for the osteosarcoma patients. In conclusion, the present study showed that miR-205 may be a promising biomarker for the detection of osteosarcoma and its down-regulation may be potentially associated with unfavorable prognosis of osteosarcoma, suggesting that miR-205 might serve as a potential biological marker for further risk stratification of osteosarcoma. Science Foundation of Qilu Hospital of Shandong University (NO:2015QLQN34). Klein MJ, Siegal GP. Osteosarcoma: anatomic and histologic variants. Am J Clin Pathol 2006; 125: 555-581. Ottaviani G, Jaffe N. The epidemiology of osteosarcoma. Cancer Treat Res 2009; 152: 3-13. Mirabello L, Troisi RJ, Savage SA. Osteosarcoma incidence and survival rates from 1973 to 2004: data from the surveillance, epidemiology, and end results program. Cancer 2009; 115: 1531-1543. Messerschmitt PJ, Garcia RM, Abdul-Karim FW, Greenfield EM, Getty PJ. Osteosarcoma. J Am Acad Orthop Surg 2009; 17: 515-527. Ta HT, Dass CR, Choong PF, Dunstan DE. Osteosarcoma treatment: state of the art. Cancer Metastasis Rev 2009; 28: 247-263. Lindsey BA, Markel JE, Kleinerman ES. Osteosarcoma overview. Rheumatol Ther 2016. Rickel K, Fang F, Tao J. Molecular genetics of osteosarcoma. Bone 2016. Durfee RA, Mohammed M, Luu HH. Review of osteosarcoma and current management. Rheumatol Ther 2016; 3: 221-243. Setoyama T, Ling H, Natsugoe S, Calin GA. Non-coding RNAs for medical practice in oncology. Keio J Med 2011; 60: 106-113. Zhang C, Long F, Wan J, Hu Y, He H. MicroRNA-205 acts as a tumor suppressor in osteosarcoma via targeting RUNX2. Oncol Rep 2016; 35: 3275-3284. Wang L, Shan M, Liu Y, Yang F, Qi H, Zhou L, Qiu L, Li Y. miR-205 suppresses the proliferative and migratory capacity of human osteosarcoma Mg-63 cells by targeting VEGFA. Onco Targets Ther 2015; 8: 2635-2642. Yang G, Zhang P, Lv A, Liu Y, Wang G. MiR-205 functions as a tumor suppressor via targeting TGF-alpha in osteosarcoma. Exp Mol Pathol 2016; 100: 160-166. Iorio MV, Croce CM. MicroRNAs in cancer: small molecules with a huge impact. J Clin Oncol 2009; 27: 5848-5856. Ventura A, Jacks T. MicroRNAs and cancer: short RNAs go a long way. Cell 2009; 136: 586-591. Wang X, Tang S, Le SY, Lu R, Rader JS, Meyers C, Zheng ZM. Aberrant expression of oncogenic and tumor-suppressive microRNAs in cervical cancer is required for cancer cell growth. PLoS One 2008; 3: 2557. Ma Q, Wan G, Wang S, Yang W, Zhang J, Yao X. Serum microRNA-205 as a novel biomarker for cervical cancer patients. Cancer Cell Int 2014; 14: 81. Hou SX, Ding BJ, Li HZ, Wang L, Xia F, Du F, Liu LJ, Liu YH, Liu XD, Jia JF, Li L, Wu ZL, Zhao G, Zhang ZG, Deng YC. Identification of microRNA-205 as a potential prognostic indicator for human glioma. J Clin Neurosci 2013; 20: 933-937. Yue X, Lan F, Hu M, Pan Q, Wang Q, Wang J. Downregulation of serum microRNA-205 as a potential diagnostic and prognostic biomarker for human glioma. J Neurosurg 2016; 124: 122-128. Orang AV, Safaralizadeh R, Hosseinpour Feizi MA, Somi MH. Diagnostic and prognostic value of miR-205 in colorectal cancer. Asian Pac J Cancer Prev 2014; 15: 4033-4037.